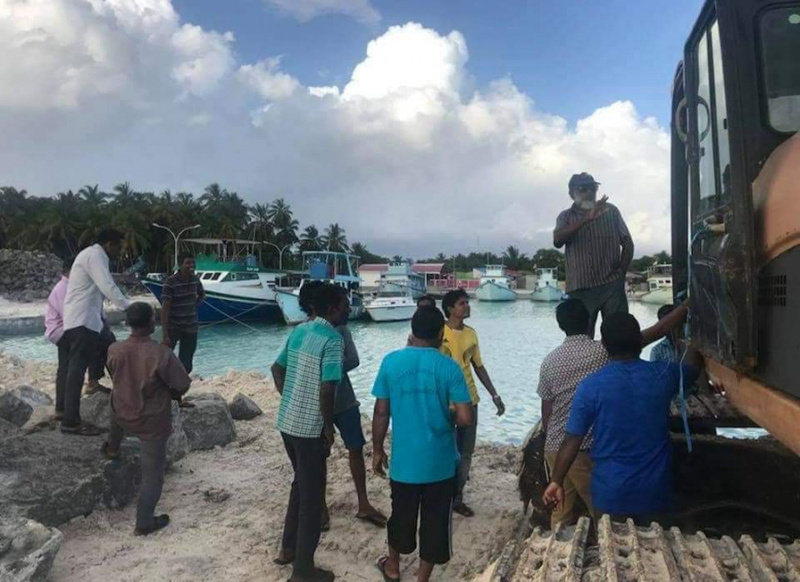 Locals from L. Maabaidhoo, led by Maldivian Democratic Party (MDP) members of the island’s council, have brought the project to develop a harbor at the island to a standstill. The ruling Progressive Party of Maldives (PPM) member of Maabaidhoo Council, Abdulla Rasheed reported to “Sun” that MDP-affiliated councilmen and 10 more locals from the island have disrupted the Maldives Transport and Contracting Company (MTCC) harbor project in the island. Abdulla said that only a few locals are causing the disruptions, and that the majority of the people of Maabaidhoo want the project to be completed as soon as possible. MTCC’s Project Manager, (Retired) Commissioner of Prisons Mohamed Husham confirmed some members of the public have caused disruptions to the company’s project in Maabaidhoo. Husham said some of the protestors boarded the company’s vehicles, preventing the project’s work from being carried out. “We were working on completing the outer seawall when the project was disrupted. The project has been temporarily disrupted due to the actions of a few,” said Husham. Protesters have demanded that the channel to the harbor be cut elsewhere. MTCC was contracted the Maabaidhoo Harbor Project on April 21, 2013. The company was contracted to build 210-meter-long and 78-meter-wide harbor, a 275-meter seawall, use revetment as part of the project. The harbor project in the 1,108-people island is worth MVR 45 million.